An aromatic molecule or compound is one that has special stability and properties due to a closed loop of electrons. Not all molecules with ring (loop) structures are aromatic. A general scientific definition can be found below. Aromatic molecules are sometimes referred to simply as aromatics. Molecules that are not aromatic are termed aliphatic. If a molecule contains an aromatic sub-unit, this is often called an aryl group. 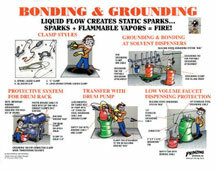 Work with flammable liquids requires proper bonding and grounding techniques. 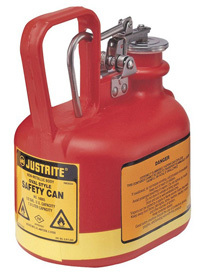 This is one of many safety posters available at Safety Emporium. An introductory organic chemistry definition of an aromatic compound is one that has a planar ring with 4n + 2 pi-electrons where n is a non-negative integer (Hückel's Rule). For those with limited chemistry experience, in the drawings of benzene above there are six pi-electrons. If you look at the first or third drawing, the double lines (bonds) between carbon atoms each have 2 pi-electrons. There are 3 double bonds in these drawings, and therefore six pi-electrons. Systems with six pi-electrons in a planar ring are aromatic according to Hückel's Rule where n = 1, i.e. 4(1) + 2 = 6. Aspiring chemists will note that our current discussion is omitting a feature of aromatic molecules called resonance that explains their chemical properties. For detailed information about the special chemical properties and chemistry of aromatic molecules, see the Further Reading links below. The term "aromatic" was used by chemists to describe certain chemicals with peculiar odors long before anyone understood what atoms were or how they might be connected to form molecules. Many aromatic molecules such as benzene and those shown below have distinctive odors (aromas), but not all aromatic molecules have an odor. Can you apply Hückel's Rule to each one? Aromatic molecules containing several fused (joined) rings are called polycylic aromatics or sometimes simply "polycyclics" for short. Those polycyclic aromatics made up only of carbon and hydrogen are called polycyclic aromatic hydrocarbons or PAH's. PAH's don't always appear to obey Hückel's Rule, but individual rings or groups of rings in the molecule can do do so and undergo reactivity consistent with aromaticity. Many PAH's are extremely potent carcinogens or mutagens. 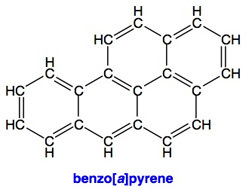 For example, the molecule shown on the right, benzo[a]pyrene is an exceedingly potent carcinogen found commonly in coal tar and soot, including tobacco smoke and diesel exhaust (both of which are listed by IARC as "carcinogenic to humans"). While individual PAH's are just one component in these mixtures, consider that smoking contributes to 80 to 90% of all lung cancer deaths with diesel exhaust estimated to cause about 6%, and secondhand smoke about 5%. Exposure to radon is attributed to about 10% of lung cancer deaths and occupational exposure to other carcinogens is from 9 to 15%. The total of these exceeds 100% because multiple exposures can be assigned in many cases (for example, a smoker in a house with high radon concentration). PAH's can also cause other cancers through skin contact and ingestion and can have reproductive as well as possibly teratogenic effects. A compound that has an odor is not necessarily aromatic. Likewise, not all aromatic molecules have an odor. When the term aromatic is used on an SDS it is referring to the chemical definition of aromaticity, not the smell or odor of the compound. Treat all aromatic compounds with respect as many of them pose serious physical and health hazards such as carcinogenicity and flammability. Use proper personal protective equipment (PPE) and minimize your exposure to aromatic compounds by using proper engineering and administrative controls. IUPAC (International Union of Pure and Applied Chemistry) nomenclature rules for how to systematically name organic molecules. Aromaticity in the Virtual Textbook of Organic Chemistry. Some examples of aromaticity at Keene State College. Introduction to Aromaticity with a historical background at UCLA. Aromatic Compounds and Aromaticity from the University of East Anglia. See also: aliphatic, hydrocarbon, organic.